Goldenfeast's Petite HookBill Formula 64oz. Also available in 32lbs, contact for pricing. 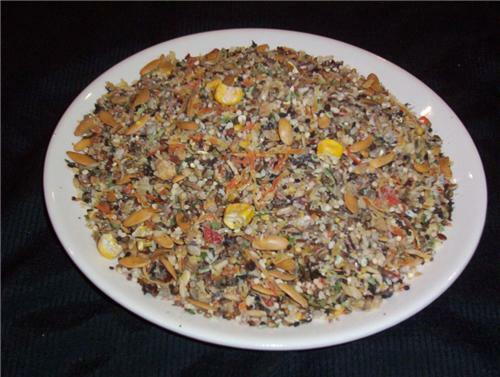 Goldenfeast has truely become our favorite line of mixes, we use many of their blends daily in our Aviary. Like this one and their Dried Vegies, Madagasgar Mix, Schmidts Original (great base mix,best price), Fruit pudding II. INGREDIENTS: Canary grass seed, steel-cut hulled oats, dehydrated carrots, cantaloupe seed, chopped sunflower kernels, flax seed, toasted soy grits, sterile hemp seed, dehydrated cherries, white proso millet, roasted peanuts, Goldenfeast® Granola (consisting of: rolled oats, rolled wheat, brown sugar, canola oil, un-sulfured dehydrated coconut, sweet dairy whey, oat flour, roasted almonds and honey), black sesame seed, hulled sesame seed, red Siberian millet, dehydrated blueberries, bentonite crumbles, dehydrated broccoli, canola seed, Japanese millet, cracked corn, air freeze dried sweet corn, chopped pecans, chipped cashews, date pieces, caraway seed, cranberry seeds and dehydrated cranberry skins, orange peel granules, dried honey flakes, dried molasses flakes, granulated mangos, granulated papaya, cooked dehydrated black bean granules, granulated pineapple, sweet basil, whole bee pollen, freeze dried celery, and dehydrated parsley, dried Lactobacillus acidophilus fermentation product, dried Lactobacillus casei fermentation product, dried Lactobacillus plantarum fermentation product, dried Lactobacillus fermentum fermentation product, dried Enterococcus faecium fermentation product, and dried Bifidobacterium longum fermentation product, and natural flavoring. GUARANTEED ANALYSIS: Crude Protein (min.) 14%; Crude Fat (min.) 7%; Crude Fiber (max.) 6%; Moisture (max.) 7%; Ash (max.) 4%. and improve their already vast array of gourmet delicacies.